Communities – Page 1718 – Welcome to Wyandotte Daily! 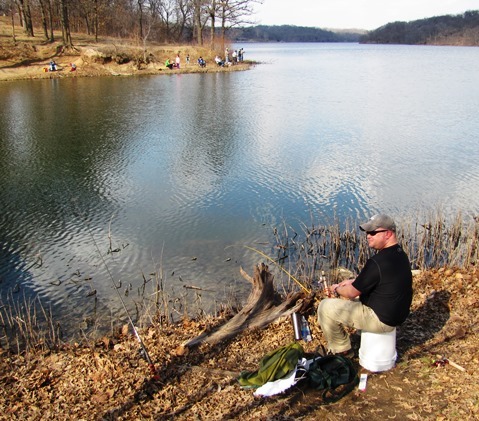 Wyandotte County Lake Park was crowded with residents enjoying 73-degree weather on opening day of the fishing season March 15. The fish weren’t biting for everyone, but the sunny skies and mild weather were enough for many to get out and enjoy a day in the park fishing, walking, biking, boating and picnicking. Opening day had been postponed twice because of ice still on the lake, and on Saturday, it looked like the ice had melted. Isabeal Castillo was fishing in the children’s pond area with the assistance of her dad, Ricardo Avila, of Kansas City, Kan. She and her family like to go fishing regularly at the lake. Isabeal said the fish were biting, but she hadn’t caught anything yet. 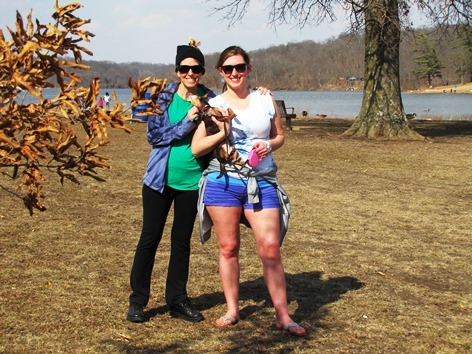 Lindsey Silvers and Shari Silvers were out walking their dog and enjoying the weather at the park Saturday. 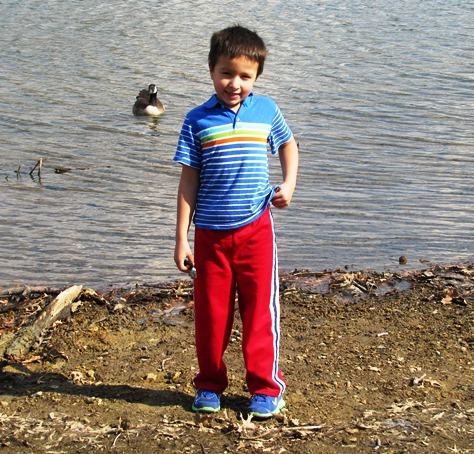 Matthew Richards was enjoying skipping rocks at the lake, with his father, Shawn. 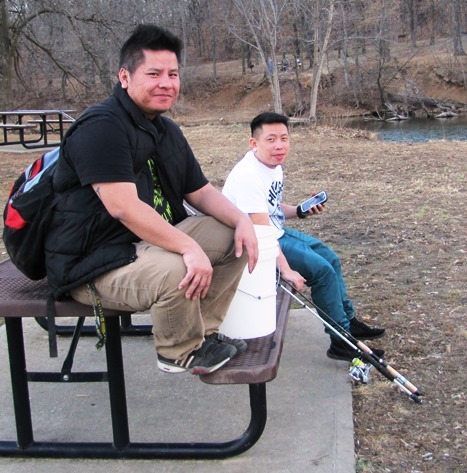 Tong Thao and Keng Vang of Kansas City, Kan., had been fishing and said they had no catches yet on Saturday afternoon. Thomas Barlow, Shawnee, Kan, has gone to opening day at the lake since the days he was a high school student at Washington High School. He reported catching two trout. He used “Power Bait,” a commercial bait that has a cheese-based product. Worms were working for some other anglers located just northwest of the lake’s administration building, he reported. The Wyandotte County Third Saturday Democratic Breakfast will meet March 15 at the Hilton Garden Inn, 520 Minnesota, Kansas City, Kan. It will be the 10th anniversary of the breakfast. Guest speaker will be Jean Schodorf, secretary of state candidate; and Sen. Pat Pettey, D-6th Dist., with a legislative report. The breakfast buffet opens at 8:15 a.m. and the program begins at 9:15 a.m. The cost is $10, or $7 for students and those on limited incomes. The meeting is open to all Democrats. Reservations are requested, but not required to attend. To make a reservation, email scottmackey08@yahoo.com by Friday, March 14. 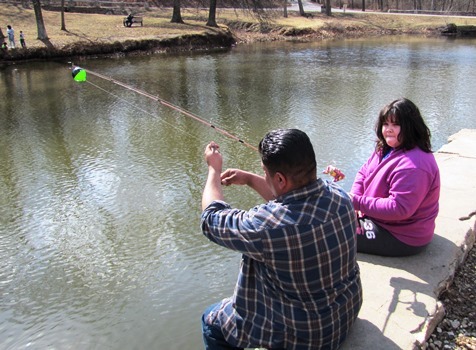 Opening day of fishing will be March 15 at Wyandotte County Lake, 91st and Leavenworth Road.